Property 14: Beautiful luxury cabin with amazing views. Property 19: Sevierville Cabin w/Deck & Hot Tub-10 Min to DT! 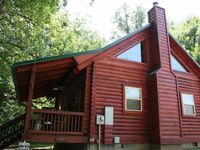 Property 21: Sevierville Resort Cabin w/Patio, Porch & Hot Tub! Property 29: Great location and Views! Private! Perfect for your Family to Reconnect! Property 33: Declan's View - Cozy 1 bedroom with Game room and Great Mountain Views! QUIET RELAXING PERFECT! Location hot tub privacy WIFI!! Property 41: QUIET RELAXING PERFECT! Location hot tub privacy WIFI!! Cute set of cabins. Clean and well stocked with usuals. Stayed here for a show at the Bijou. Sufficient for a couple of nights. Great jets on the hot tub! Only reason for 4 stars is lack of privacy. Cabin sits in a group of others along side a hydro farm.